Click the image to take a look inside ! Wayne and Mel Invite you to the new look Whitakers, keep a look out for special offers. HOME MADE MEAT & POTATO PIE – Rich slow cooked steak and potato pie served with seasonal vegetables and either chips or mash. BANGERS & MASH – Locally sourced sausages in onion gravy with mash and vegetables (Quorn sausages available). HOME MADE DEEP FILLED BEEF LASANGE – Served with garlic bread and either chips or salad. Yes, why not let them try our Kids Menu. 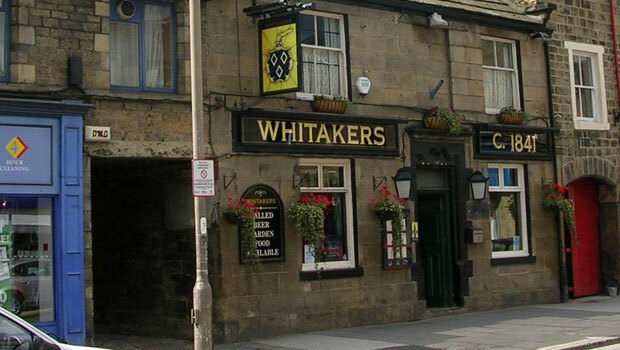 The Whitakers built in circa 1841, and probably a little restored at the front. It has **corbel stones on the roof, the one on the left still supporting the corbel tablet, whereas the one on the right appears to have been taken down when the Red Lion was built alongside but the corbel stone itself replaced. **In architecture a corbel (or console) is a piece of stone jutting out of a wall to carry any superincumbent weight. This inn has been locally known as the DRAM SHOP, KIRKGATE VAULTS and QUIET JOHN’S VAULTS, the latter being a name given from the character of the licensee between 1900 and 1911. The cellars have stone arched roofs, and from one of the beer cellars is the entrance to an underground passage, said to lead to the Parish Church, but for what reason no one seems to know. In any case, in almost every instance where the entrance to an underground passage exits, it has been found to be merely the entrance to some other storage cellar which has either fallen in or been blocked up. As an inn, it goes back to the middle of the last century, but earlier still it was owned and occupied by Edmonde Maude, who in 1820 is described as Wholesale and Retail Spirit Dealer. William Watson appears to be the first Landlord (in 1865), followed by William Livingston in 1878. The next one was William Metcalfe (1881), followed by James Shackleton (1895), John Ackroyd (1900), Ann Ackroyd (1911), Henry Ashwell (1913, Thomas Brogan 1917, Margaret Brogan (1921) Ernest Kitchen (1923) and Charles E. Greaves in 1937. The passage on the extreme left is the entrance to Maud’s Yard which derived its name from the owners of the property. In the 17th century a well to do yeoman family of Burley, named Maude, purchased property in Kirkgate, Otley. One member of the family – John – was an officer in Cromwell’s army at Marston Moor in 1644. In 1720 William Maude owned the property, a dwelling house, four cottages behind, and other outbuildings in which he carried on the business of a whitesmith. A century later (1822) it was still in the same family, the dwelling – now the present Vaults – was owned and occupied by Edmonde Maud, described as “Raff and Iron Merchant, Sub-distributor of Stamps, and Wholesale and Retail Spirit Dealer,” premises which were purchased by Wm Whitaker & Co., Wine and Spirit Merchants, in 1904. March 1923 saw an application for a transfer of the licence from Mrs. Margaret Brogan to Ernest Kitchen, of Carlton, Lane, Guiseley, an attendant at the West Riding Asylum, Menston. Evidence as to Mr. Kitchen’s character was given by Mr James Tempest, a member of the Otley Urban Council, and Mr. John Eyre of Otley. The Landlord, in 1988, had the back garden cleared out and stumbled across an enormous underground vault. He thought he would apply for planning permission to convert the vault into a wine bar. A representative from Otley Museum inspected the site and estimated that it dated back to the 17th century. Judging from the rusty meat hooks, it was thought it could possibly have been used as a cold store. It was sited below a former stable that was paved, but no-one suspected that the vault was there. It is amazing what people will do to raise money, for in 2009, the then Landlord Wayne Green, together with Andy Forrest, a regular, sat down and polished off a half-pint full of live maggots each. The sponsored ‘maggot drink’ was in aid of Macmillan Cancer Support, the pub’s chosen charity for the year. In November 2010, Chennell & Armstrong Ltd., the owners, decided to sell the leasehold pub. A spokesman for the owners said the pub, along with others, were going on the market due to the retirement of commercial director David Statner, with the company deciding to reduce their day-to-day operations. Wayne and Mel in May 2011 became the new lease holders of Whitakers to the delight of their many loyal customers. December 2010 saw the landlords, Wayne and Mel, win first ale house award. Staff dressed up in period dress for the Victorian Fayre which attracted more than 16,500 people on Sunday, December 12, – and also decked out the inn in decorations to give it a back-in-time look. Their efforts were recognised when judges of the inaugural Victorian Fayre Ale House Award visited and were so impressed they decided to award the pub first prize. Winners Wayne and Mel said they were delighted to have received the inaugural trophy as winners of the Victorian Fayre Ale House Award. They said they have always wholeheartedly thrown themselves and staff into the spirit of what the fair means to Otley as a town and local trade and pubs in particular.